Bemis Company, Inc. manufactures and sells flexible packaging products and pressure sensitive materials primarily in the United States, Canada, Mexico, South America, Europe, and the Asia Pacific. The company operates in two segments, Flexible Packaging and Pressure Sensitive Materials. The company is member of the S&P 500 and was a recent addition to the S&P Dividend Aristocrats index. Bemis Company has paid dividends annually since 1922 and quarterly since 1931 and consistently increased payments to common shareholders every year for 26 years. 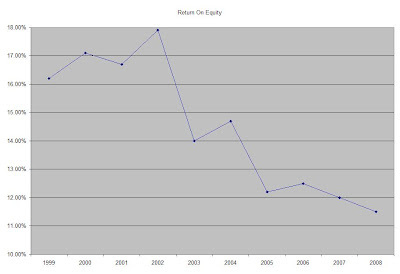 From the end of 1998 up until December 2008 this dividend growth stock has delivered a negative annual average total return of 5.30% to its shareholders. The stock has lost over one third from its all-time high in 2007. The company has managed to deliver a 4.70% average annual increase in its EPS between 1999 and 2008. Analysts are expecting flat EPS of $1.60 for 2009 and a slight increase to $1.75 by 2010. Bemis has not been able to increase profitability since 2004, as its earnings per share have remained flat. One bright statistic is that cash flow per share has increase from $2.88 in 2004 to $3.26 in 2008. The Return on Equity has decreased over the past decade from 16% in 1999 to 11.50% in 2008. Rather than focus on absolute values for this indicator, I generally want to see at least a stable return on equity over time. Annual dividends have increased by an average of 7.5 % annually since 1999, which is higher than the growth in EPS. If earnings per share remain flat, future dividend growth would be far from spectacular. A 7 % growth in dividends translates into the dividend payment doubling every ten years. If we look at historical data, going as far back as 1988, Bemis Co has actually managed to double its dividend payment every seven years on average. The dividend payout ratio is currently above 50%. A lower payout is always a plus, since it leaves room for consistent dividend growth minimizing the impact of short-term fluctuations in earnings. If earnings remain flat and the company doesn’t start any cost cutting initiatives, future dividend growth could be jeopardized. Currently Bemis Co is trading at 15.50 times earnings and yields 3.70%. It does seem that Bemis Co is attractively valued at the moment based on yield and price/earnings mutliple. The flat earnings, decreasing returns on equity and rising dividend payout ratio make this stock a hold, not a buy. I would only add to existing position there if I owned it or initiate a small position in Bemis if the stock drops below $18.